Michael Thompson shot a solid even par 70 during the first round of the AT&T National on Thursday. The even par round was good enough to put him in a tie for 29th. The general consensus from the Aronimink Golf Club in Newtown Square, Pennsylvania is that the AT&T National is playing more like a US Open than US Open just completed at Congressional. Fast, hard greens, firm fairways and difficult hole locations are making players work for every shot and the high scores from round 1 reflect the how tough the course is playing. Only 28 of 120 players were under par and the average score was 71.5 on the par 70 course. Michael's round contained two birdies and two bogeys. Michael did exactly what you need to do on this course: hit fairways and greens in regulation (GIR). For the first round, Michael hit 10 out of 14 fairways (T18th) and hit 16 out of 18 GIR (T2nd). The solid round came on the heels of his PGA Tour best ever 62 in the final round of last week's Traveler's Championship. Michael will be teeing off from the tenth hole on Friday in the last group of the morning at 8:59am ET. One of the added benefits of last week's fourth place finish for Michael Thompson was a spot in this week's 120 man field AT&T National. Normally on the PGA Tour, finishing in the top 10 gets you into the following week's tournament. However, that wasn't the case for this week's tournament since it is a smaller field invitational. However, the Tiger Woods Foundation extended a sponsor's exemption to Michael after his final round 62 last week. Just called Michael Thompson (62 today) and gave him an exemption for next week. He was happy. Well deserved. No top 10's here b/c of Invit. Michael will be teeing off from the first hole on Thursday in the last group of the day at 1:39pm ET. The Travelers gives us an opportunity to meet someone new, such as Michael Thompson. Before the 26-year-old came out of nowhere and shot a 62 to finish a career-best fourth on Sunday, his was a name we didn’t know. As it turns out, he’s got a nice little story. Maybe we should have known Thompson, because he advanced to the final of the 2007 US Amateur, losing to Colt Knost at the Olympic Club. That run got him into three professional events in 2008: the Masters (73-78, missed cut), the US Open at Torrey Pines (74-73-73-72, tie for 29th), and the Travelers Championship (65-67-72-73, tie for 59th), which extended him a sponsor exemption. So what did it look and sound like at your house as you were watching Michael Thompson blaze a trail up the leaderboard during Sunday's final round at the Traveler's Championship? Here's what it looked and sounded like in Phoenix (where the Thompson Tide crew are vacationing) when Michael stuck his tee shot on 16 within 14 inches of the hole. Keep in mind that we were trying to be quiet since we thought that we might use some of this "high quality" phone video for the website. You should all be very happy that the PGA Tour website had lots of video we could post! And to answer the question, "Yes Reid, that was almost a hole in one!" Two weeks ago Friday, Michael Thompson had just missed the cut at the Fed Ex St. Jude Classic. Nonetheless Michael was not discouraged. On twitter he declared "For those of you tweeters who might be freaking out about my missing cuts, do not fret. I had an epiphany today and I promise there is better golf to come!". The tweet proved to be prophetic as he rebounded this week and shot all four rounds in the 60's (a PGA Tour first for him) including a PGA career best 8 under on the final day, leading to a solo 4th finish at the Travelers Championship. He had an amazing final round in which he shot 6 under on the closing 9 holes. The stretch included two amazing approach shots on 16 and 18. Video of the birdie on 18 is included above. The birdie on 16, in which he landed his approach within 14 inches was one of the PGA Tour's "Top Shots of the Day". In an article posted on PGATour.com, he said his epiphany was regarding his driving, which he had been working on with swing coach Susie Meyers. “My putting’s always been my strength, but off the tee I’ve struggled, and in the last month or two, I’ve really come into my own in terms of being able to hit fairways and get myself in position to hit good shots,” Thompson said. The excellent finish this week will vault him up the rookie reshuffle list about 15 spaces, which will in turn lead to additional opportunities to play in more tournaments. Additonal opportunites have already presented themselves, as he was invited to play in next week's AT&T National. He had been scheduled to have a week off, but as all rookies on the PGA Tour know - plans change. The 4th place finish also vaults him up the official money list to 119th which is important because the top 125 money leaders at the end of the year earn a PGA Tour card for the following year. 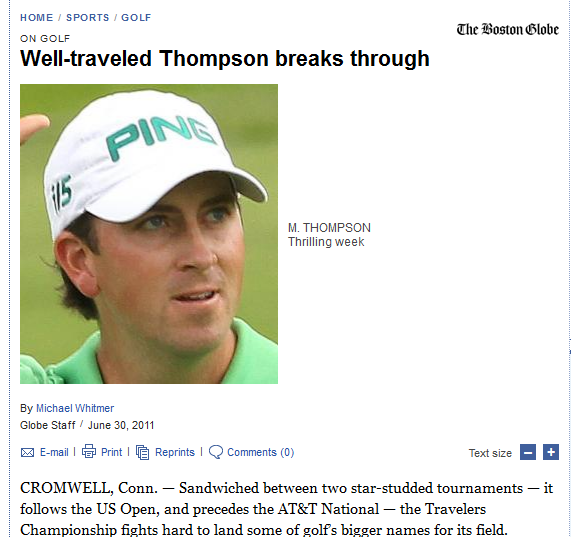 There's been several articles written about Thompson's success at the Traveler's Championship already. Here's the ones we've found. We'll post additional links as we find new things. When Is a Hole In One Not A Hole In One? Michael Thompson was tearing it up at the Traveler's Championship today when the impossible became big news. The PGA Tour posted Michael's score on hole #7 (434 yard par 4) as a hole-in-one. There has been only one hole-in-one on a par four in PGA Tour history. At the time, it moved him into a tie for first with amateur Patrick Cantlay who's currently leading. The sudden jump up the leaderboard created quite a buzz on the internet and at TPC River Highlands in Cromwell, Connecticut. Unfortunately, Michael's "miracle" hole-in-one was just a scoring error. In reality, Michael was sitting in the fairway and would eventually par the hole. The scoring error wasn't corrected for over 10 minutes. Despite the scoring error, Michael still had a fantastic day finishing 36 holes at 8 under par and he is currently tied for 7th. The second round is still underway and will be completed Saturday morning. It's often said we learn more from our failures than our successes. According to Michael Thompson, he had an "epiphany" after missing the cut at the Fedex St. Jude Classic in Memphis, Tennessee on Friday. The cut line sat at its eventual +2 for most of Michael's second round, as he teed off late in the day. Michael finished his front nine at one under par, just inside the cut line. However, bogeys on holes #11 and #14 left him on the wrong side of the cut. He had several birdie opportunities on the back nine that just weren't to be. he eventually had a meaningless double bogey on hole #18 that left him at +3 for the day and +6 for the first two rounds. For those of you who might be freaking out about my missing cuts, do not fret. I had an epiphany today and I promise there is better golf to come! The PGA Tour reshuffle list will be updated tomorrow. After taking next week off, Michael should be back in action at the Travelers Championship in Cromwell, Connecticut. Michael played in the 2008 Traveler's Championship as an amateur and finished in a tied for 59th. One of the marks of a great athlete is the ability to shrug off a bad performance and not allow it to affect future performances. Michael Thompson has shown this ability throughout his career but yesterday was a great example in a short span of time. To say Michael had a rough start is putting it mildly. He started the round with a double bogey followed by two bogeys. He was four over par after the first three holes of the day. He could have gotten down and his scorecard could have "blown up". There were plenty of rounds in the high 70's and low 80's out at the Fedex St. Jude Classic yesterday. Instead, Michael proceeded to put the first three holes behind him and shoot one under par for the remaining 15 holes of the day. Over those 15 holes he had one birdie at the Kodak Challenge 14th hole and he had fourteen pars. To put that in perspective, there were only 32 rounds under par all day at the difficult TPC Southwind course. Michael still has some work to do in order to make the cut which should probably be around +2 for the tournament but that is definitely within reach. He'll be playing in the heat of the afternoon today as his second round will get underway at 1:39pm ET from the first tee. Earlier in the week, Michael Thompson shot two rounds of 72 in the US Open Sectional Qualifier in Rockville, Maryland. Unfortunately, the combined 144 wasn't good enough to qualify for one of the 10 spots up for grabs. After the Qualifier, Michael headed south to Tennessee where he's competing in the Fedex St. Jude Classic starting tomorrow. 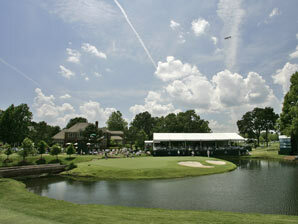 The Fedex St. Jude Classic is played at TPC Southwind in Memphis. The course averaged nearly one full shot over par last year and is known for tight fairways, small greens, and numerous hazards. 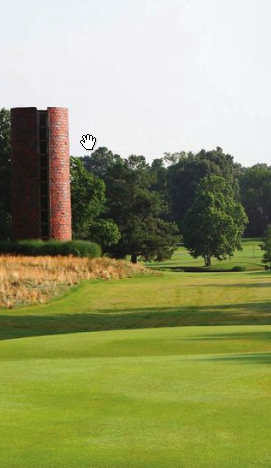 In addition to the course, players will be fighting the heat which will be in the mid 90's with more than 50% humidity for the duration of the tournament. Michael's first round gets underway at 8:39am ET on Thursday. He tees off from the tenth hole. Michael's fourth round got off to a bit of a slow start as he posted his lone bogey of the day at the first hole. From there on however, he played really "slick" golf posting 5 birdies, hitting 11 out of 14 fairways, and reaching 16 out 18 greens in regulation. What a day! Had a lot of chances today and very excited about my first top ten of the year! Roll Tide!!! Let's keep it going tomorrow! 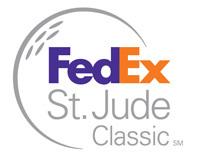 After tomorrow's qualifier, Michael will be headed to Memphis, Tennessee to compete in the Fedex St.Jude Classic (PGA Tour event). Update: Michael did not finish in the top 10 at the qualifier, thus he'll be missing the US Open this year. 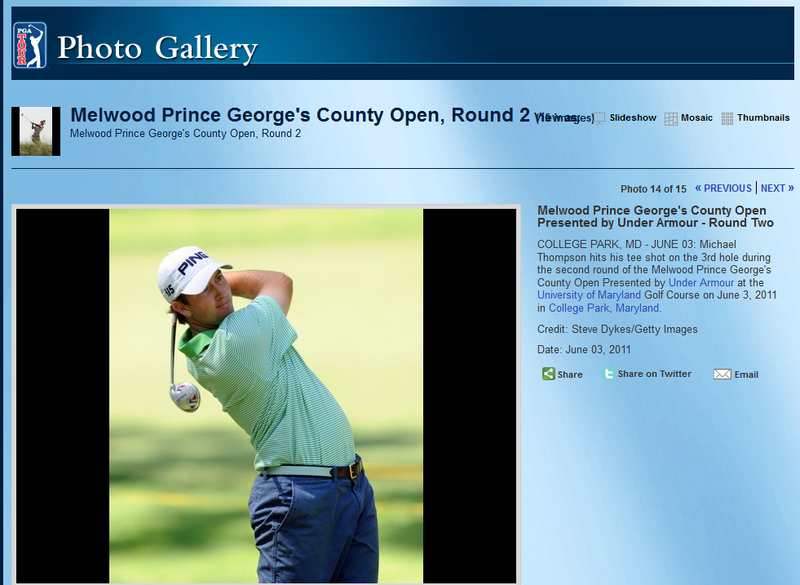 Golf Channel Coverage Features the "Thompson Twins"
If you didn't catch the Golf Channel's coverage of the third round of the Melwood Prince George's County Open, you missed a lot of live coverage of Nicholas and Michael Thompson (no relation). The Golf Channel dubbed the pairing "The Thompson Twins" and used the 80's band of the same name to provide a soundtrack for highlight packages and song titles as keys to the round in the "Craig's List" segment. Michael had slipped down the leader board a bit by the time the television coverage came on live. He shot one over on the front nine notching just one birdie and making two bogeys. However, once the coverage came on, Michael's game heated up. The television coverage came on just as Michael was hitting his second shot on the par 4 tenth hole which he landed within 12 feet of the hole. Michael's putter has been on fire all week and he made the birdie putt to get his back nine going. He birdied the eleventh after making a 15 foot putt to move to one under for the day and then proceeded to rack up 5 consecutive pars before he birdied the last two holes of the day. The three under 68 moved Michael to -10 for the tournament which is good enough for a tie for seventh. Unfortunately for Michael and the rest of the field, Steve Wheatcroft has outpaced everyone and heads into the fourth round with an eight shot lead as he's -22 over the first three rounds. There's a few more photos that were taken yesterday. You can see them here. Michael is paired with Gary Christian tomorrow and tees off at 12:05pm ET. The fourth round will be televised on the Golf Channel from 2:00pm - 4:30pm ET. Michael Thompson had another solid day at the Melwood Prince George's County Open. He shot 1 under par and ended in a tie for 4th. Make sure to set your DVR tomorrow (Golf Channel from 2:30pm-5pm ET), because he had a ton of TV coverage today. Here's a quick recap of Michael's first eight holes that they showed on the Golf Channel. There should be plenty of "Thompson" fans following Michael's group for the third round since Michael is paired with Nicholas Thompson (no relation). The Thompsons tee off at 12:45am ET. The following photo was posted on PGATour.com after round two. The original can be found in this slideshow. There's also some additional photos on the Getty Images website. So Just How "Hot" Was Thompson's Start? 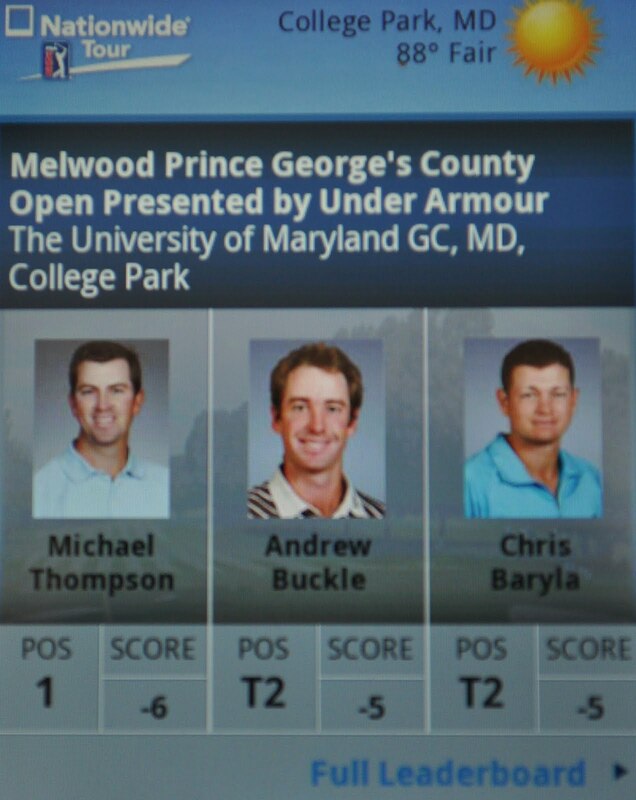 This image captured from the PGA Tour's mobile application after Michael completed his first round says it all. 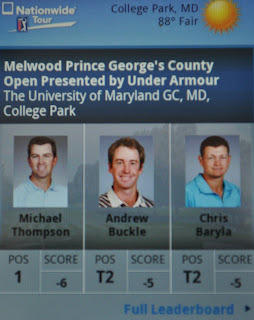 Michael Thompson got out to a great start today on the Nationwide Tour, shooting a 6 under par 65 at the Melwood Prince George's County Open. The 7:20 tee time proved to be in his favor as near perfect weather met him on the first tee. He scored two birdies on the front 9, and then hit his stride on the back nine, scoring 5 more birdies before the day was through. A lone bogey on hole 13 was the only miscue of the day. So hot was his start that for parts of the morning, he held the outright lead, which eventually settled out into a tie for 2nd once the second wave of players made their way through. Thompson got some good press as a result of his great play today. On PGATour.com he was mentioned in Joe Chemycz article "Nine-birdie performance has Baryla ahead in Maryland"
"Thompson, like Baryla, is a member of the PGA TOUR this year but hasn't had much luck in his rookie season. Runner-up at the 2007 U.S. Amateur, an All-American at Alabama and a Palmer Cup team member hasn't translated into instant success. "It reminds me a lot of when I first turned pro because I was a big fish in a little pond in college and then when I got on the Hooters Tour I was a little fish again," he said. "I'm going through the exact same thing here, I'm a little fish again." Thompson has made only five cuts in 11 TOUR starts with a T14 at the Puerto Rico Open his best effort to date. "I've just got to fight through that, keep believing in myself, keep working hard and days like today will happen. Hopefully they happen four days in a row. It's all a process." If he continues doing as well as he did the first round, he is sure to get some good coverage on the Golf Channel tomorrow. His 12:25 EST tee time lines up with the televised coverage so you might want to go set your DVR now. Today's televised coverage did not start until after he had already finished playing, so he only had one replay shown. Michael Thompon begins his second Nationwide Tour event of the year Thursday as the opening round of the Melwood Prince George's County Open gets underway in College Park, Maryland. He is paired with fellow PGA Tour rookie Andres Gonzales and Nationwide Tour player Rob Oppenheim. They tee off at 7:20am local time at the par 71 University of Maryland Golf Course. All four rounds of the tournament will be carried on the Golf Channel starting Thursday from 12:30pm-2:30pm ET.